A great solution for gas station islands, the Auto Attendant® provides added value at the pump and helps increase safe driving practices. Two self-serving windshield washing station with towel dispensers on either side of the trash receptacle offers convenient self-service for customers. The 20 gallon concrete service station is reinforced with 1/4" steel rebar reinforcing the unit's strength and resiliency. The cast aluminum funnel top helps ensure pitch-in trash makes it into the receptacle. A security cable connects the lid to the base so nothing is misplaced while accessing the polyethylene liner. The double sided Auto Attendant® towel dispenser accommodates 1 or 2 ply folded 10 x 10 paper towels (not included), and meets ADA guidelines. 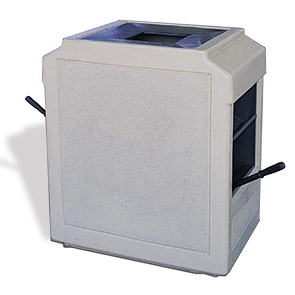 Complementing single sided Auto Attendant® and stand-alone receptacle are available.